Anthony Duclair is a bit embarrassed about bouncing around to various teams and taking a league-minimum, one-year deal. Duclair signed a $650,000 contract Friday for next season with the Columbus Blue Jackets, his fourth NHL team. 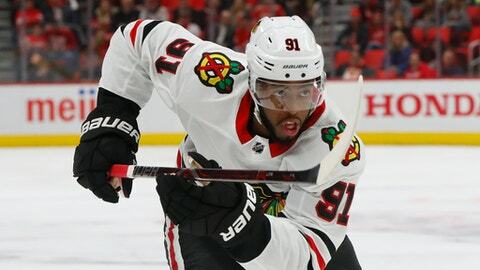 He’s been traded twice and last week became an unrestricted free agent when the Chicago Blackhawks decided not to offer him a contract to retain his rights. Columbus was one of a few teams interested in signing Duclair, a 2013 third-round pick who won a world junior gold medal with Canada and spent time with the New York Rangers, Arizona Coyotes and Blackhawks. The one-time 20-goal scorer remains unfilled potential after parts of four NHL seasons. Duclair was traded by the Rangers to the Coyotes in 2015 and put up career highs with 20 goals, 24 assists and 44 points the next season. Arizona traded him to Chicago in January, and the Blackhawks declined to qualify him after eight points in 23 games. Being demoted to the American Hockey League during the 2016-17 season was Duclair’s first taste of adversity as a professional. It may prepare him for the next step as a full-time NHL player. If he can rediscover his 2015-16 level of production, he’ll help Columbus replace Matt Calvert, who signed with Colorado. The Blue Jackets signed center Riley Nash to an $8.25 million, three-year contract when free agency opened. Duclair said Kekalainen and coach John Tortorella were on board with signing him, which made Columbus his preferred destination for a possible career-defining year.